Alex Unitt scored twice as Whitnash beat Hawkesmill in an 11-goal thriller. 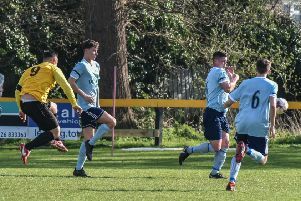 Whitnash Town boss Barry Shearsby admitted his side’s 7-4 win over Hawkesmill Sports was not one for the faint-hearted. On a heavy pitch, Town found themselves 2-0 up inside the first eight minutes but despite doubles from Alex Unitt and debutant Travis Lee and further strikes from Craig Watkin and Charlie Smith, they could not rest relax until Spencer Bradley added a seventh in the 90th minute. Despite fielding a much-changed line-up, Town took control early on, with Unitt neatly lobbing the onrushing keeper from the edge of the area and Watkin smashing in his second free-kick in a week. Hawkesmill responded well and were level just short of the half-hour mark with a quickfire double of their own. The ebb and flow of the match continued, however, as Lee twice beat the offside trap to shoot home and restore Town’s two-goal cushion at the interval. With the wind behind them in the second period, Whitnash allowd complacency to creep in, with Haskwesmill taking advantage of poor defnding to bring it back to 4-3. The goals kept coming, with Callum Bell’s cross finished off at the far post by Smith to make it 5-3. Unitt fired home from the edge of the are to give the home side some breathing space but Sports never gave up and pulled it back to 6-4 with ten minutes remaining. However, as they continued to commit players to attack, they left themselves open at the back and Bradley punished them in the dying seconds to wrap up the three points for a relieved Shearsby. “With so many away I was delighted with the three points but would not want to watch a game like that again,” said Shearsby. “Both teams looked like scoring every time they entered the opponents’ half. “It was not good for a manager’s heart or already receding hair line! Town host Folly Lane tomorrow in the second round of the Coventry Charity Cup. Folly Lane won the original tie 3-1, but it was ordered to be replayed after they fielded an ineligible player.